“Mom, we need you!” Madilyn, my six-year-old, screams from the playroom. I walk in and see glitter glue dripping from the playroom table, onto the carpet. Juliana, my three-year-old, decided to dump an entire bottle of glue on the table and “paint” herself and the furniture with it. At that moment, I knew I needed to take control of the messes in our home because there are so many of them that can be avoided. I know that kids are kids and that messes are going to happen. 1. Minimizes the amount of work for moms who already have enough to do around the house. 2. Teaches kids the importance of not wasting resources, and how to respect the home and other family members. We are not perfect with taking control of the messes in our home, but I like to think we are better than we were a month ago, and that, my friend, is progress. For me, if my house is a total mess, I am a total mess as a mom. I know that cleaning messes is a part of parenting, but I also know that if I feel out of control, then I turn into that mom who yells and complains – and nobody wants that. Plus, after the girls go to bed, I don’t want to spend two hours cleaning up spilled milk, Legos, and dried paint on the craft table. I want to sleep and watch some Netflix. Let’s be real, moms. My daughters, ages 6 and 3, are capable of more cleaning and organizing than I give them credit for. We do “5 minute clean up” every night around 5:30 PM. So we spend a 5 minutes and clean up the living room and playroom before my husband comes home from work. We have fun and I turn on music, and we try to make the most of it. In a sense, I trick the girls into cleaning but it works. As a mom, I used to feel like I have to do everything for them. However, I am realizing that I am teaching them better life skills if I teach them how to clean up their own messes, manage their own rooms, and help me around the house. They live in the home too so they need to respect it. There is a fine balance between letting kids be kids and allowing them to disrespect their home. One of our responsibilities as parents is to define that line. I know that I want to live in a home that is peaceful, and un-cluttered. I want to be a patient mom and I know that my house needs to be decently clean and organized or that patience is lost. I’m not a maid and it is everyone’s responsibility to take ownership of their things, respect them, and put them back where they belong. 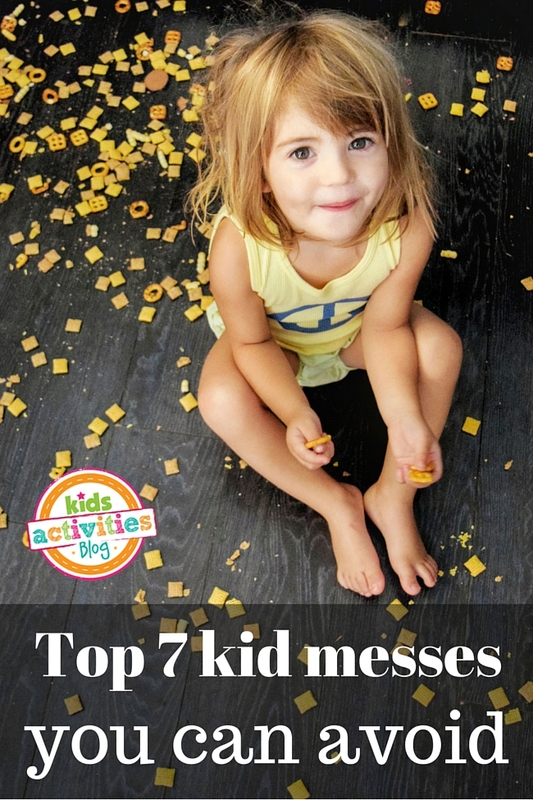 Here is my list of the top 7 kid messes you can avoid. Granted, we are not perfect with these. Yet, I try to follow these rules in our home to minimize the messes. However, think about them and decide which one(s) you could start to implement more in your home and life. Brian, my husband, and I both were raised with this rule in place. We were not allowed to eat in the car or upstairs in our bedrooms. We try to follow this rule with our girls as well. Not only does it promote healthier eating habits for the family by sticking to mealtimes and less snacking, it also prevents food messes in rooms beyond the kitchen and living room. Plus, who wants to clean up food in the car and in the car seats? Not me. Now that the girls are older, we will allow them to occasionally have something in the living room, but not often. We keep drinks in the kitchen as well. No drinks in the living room or playroom means less water messes all over the house. Our girls know that they eat meals and have some snacks, but they have to ask a grown-up. They are not allowed to just go in the fridge and get what they want. We don’t let them have free range in the kitchen. For one, they are young and do not have the self-control around food like us adults do. Of course, they would eat all the chocolate chips in the cabinet if they are given the opportunity! With our 3-year-old’s allergies to nuts, we just made it a rule that a grown-up has to be in the kitchen to help them with food. We have to really monitor what she eats. Plus, it minimizes messes in the kitchen. They do help me in the kitchen with meal prep and they love doing “buffets” where they can make their own plates. They love helping me make my famous cinnamon pancakes on Sunday mornings and they love helping me chop up veggies for spanish rice. Of course, food messes are going to happen. However, setting some ground rules in the kitchen and around food makes everything easier. This is a big one for my husband. He hates the thought of dirty shoes all over our carpet and on the hardwood floors. Not only does it minimize messes all over the house not wearing shoes, it helps keep the house more sanitized and stop the spread of allergies and germs. It is a good habit for kids to learn when they go into other homes. It shows respect. In our home, we try to leave the messy shoes downstairs in the basement – tennis shoes covered with sand from the sandbox and rain boots covered with mud from jumping in puddles. This way, they are not upstairs in our main foyer. This avoids sand and mud all over the downstairs. If it is really messy outside, I even have the kids take their shoes off on the porch and I deal with them later after they go to bed. I keep our glue and paints and markers up high so little hands can not get to them when I am busy with other things. My girls know to ask to use these things. Again, we set rules around crafts just like we did around food. Kids want boundaries and guidelines. They thrive on it. Sure, they can have freedom in the craft they are making. However, glittering my carpet is not a freedom they have. I try to take the really messy crafts outside if I can. My girls love painting outside! Less is more when it comes to toys. I recently donated nine garbage bags of toys and crafts to free up space in our home. What a weight that has been lifted. Not only is my house less cluttered, the girls are less overwhelmed. They enjoy having less in their playroom and in their bedrooms. I try to keep only age appropriate toys within their reach which means going through the toys on a regular basis and donating things they are too old for, and no longer use. Also, I got rid of toys that have a million pieces. I am not spending my evening reorganizing toys. It’s not about all the stuff. It’s about the interactions with our kids. With less stuff in playroom, I want to go in there now and play with my kids! This is a huge win. One of the messiest times of the day I was finding, was after school. Now, we have a system where the book bag and lunch bag go. Madilyn knows she has to go upstairs after school and change out of her school clothes and hang them up or put them in her hamper. We have a “no clothes on the floor” rule in our house. My rule is that I will wash and fold their clothes, but they can help put it away in their drawers and closet. I really try to teach the girls to respect their things. Having nice clothes is a privilege and throwing it on the floor is disrespectful. Bath time can be so chaotic and messy. We got rid of all the bath toys because to be honest, I was sick of them all over the place! We replaced all the toys with a couple cups and the girls love it. They play coffee shop and pretend to make coffee drinks. Easy and less stuff all over the place. Plus, they know that mommy and daddy are in charge of doing the shampoo and soap. If not, they would dump shampoo everywhere. Again, this is wasteful and a total mess. It’s all about setting boundaries. Moms, yes, some messes can be avoided or at least minimized. 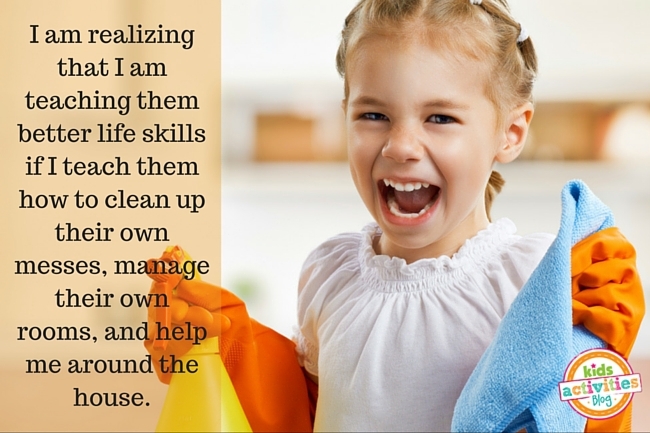 If your kids are old enough, give them the responsibility to help clean and organize. Set some ground rules around messes and see what they are capable of. Stop spending all your free time cleaning-up. 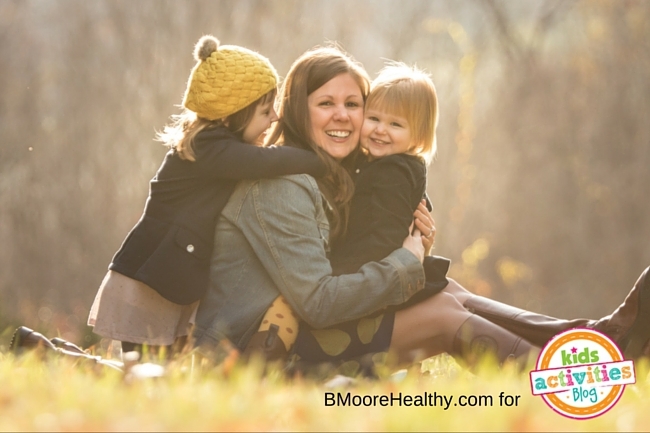 Share the work, mamas, and try to minimize a few kid messes in your life.